Published on 1 July 2012. You’ll need a sharp pair of eyes to spot the figure on the end of this bungee rope, right in the centre of the photo. You can see rather more easily the Sage, the Tyne Bridge (complete with Olympic rings), the Castle Keep, and St Nicholas’s and St Mary’s cathedrals, all of which I’ve featured previously! You can also see the quayside’s Sunday market in full flow; a bit of the 136 year old Swing Bridge, whose predecessors date back some 1,800 years or so to the Roman Pons Aelius; a smidgen of Robert Stephenson’s High Level Bridge, from which hundreds of people watched the Great Fire of Newcastle and Gateshead in 1854; and the roof of HMS Calliope, the stone frigate on the Gateshead bank of the Tyne. You can’t see the talented young musicians performing in the North East Youth Steel Pan Festival, part of ¡Vamos! 2012. This festival was actually my reason for visiting the quayside this afternoon, but inclement weather moved it indoors, which would’ve made a fairly dull photo. So you’ve got a bungee jumping nutcase from outside instead! 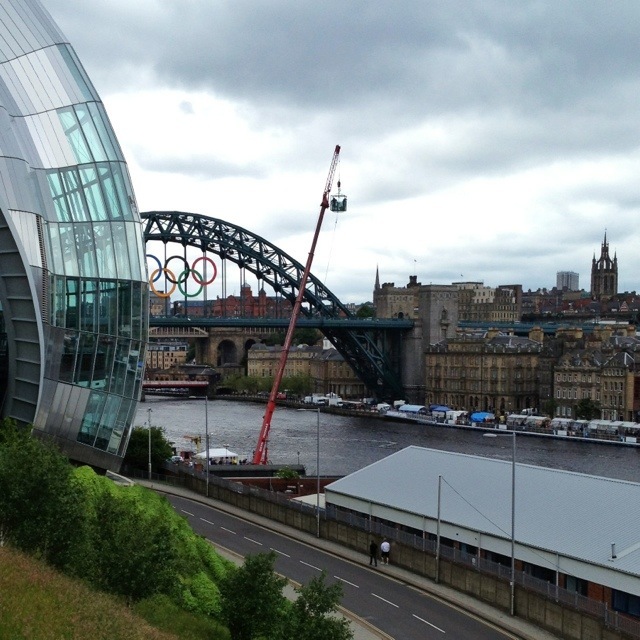 This 1,707th post was filed under: Photo-a-day 2012, Gateshead, Newcastle, The Sage, Tyne Bridge.